Obverse: Portrait of the King Gustav VI Adolf (1882 - 1973) in half profile. Reverse: Mother Svea holding a Three Crowns (Tre Kronor) shield (Moder Svea, Mother Swea), a national emblem of Sweden. Watermark: Vertical sequence of portraits of August Strindberg in profile and "5 KR" spread throughout the rest of the banknote. Signatures: (as depicted) Ragnar Persson, Sven Joge. Dominant colour: Brown. Security thread: Vertical, solid, embedded, 0.33 mm wide. Issuer: Sveriges Riksbank. Printing method: Intaglio. Date of Issue: 1963. Artist: Unknown. Date of withdrawal: 31 December 1998. Material: Cotton fibre paper. Printer: Tumba Bruk, Sweden. Texts: Sveriges Riksbank. Fem Kronor. 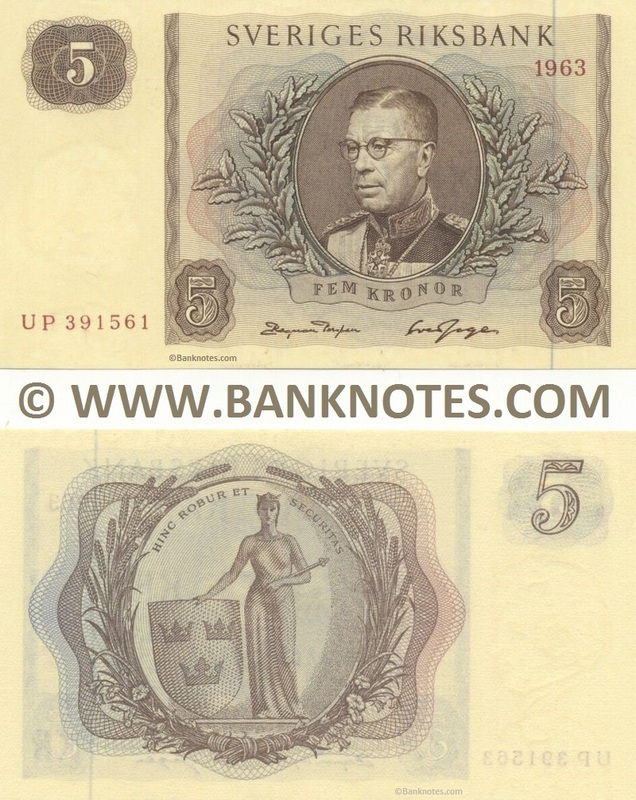 Five Kronor (Crowns). Hinc Robur et Securitas.